Lucio Fontana, Concetto Spaziale, Attese, 1967. Fausto Melotti, I Maggio, 1971. Installation view. Photo courtesy of Mazzoleni. Mazzoleni London is pleased to announce “FONTANA / MELOTTI: Angelic Spaces and Infinite Geometries” opening to the public on September 28. 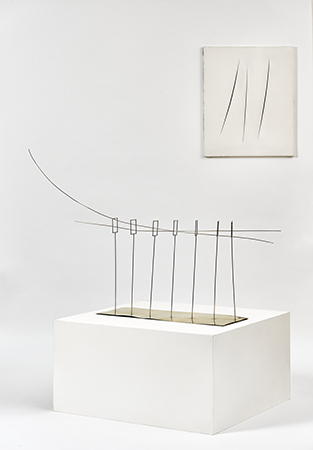 Curated by Daniela Ferrari, art historian and curator at the Museum of Modern and Contemporary Art of Trento and Rovereto (MART), Italy, the exhibition will explore the parallels in the theory and practice of Lucio Fontana (1899–1968) and Fausto Melotti (1901–86), focusing on their later work and the ways in which both artists conceived of and responded to notions of space and geometry. Highlighting over 30 paintings and sculptures, the exhibition will consider Fontana’s engagement with the eternal and infinite against Melotti’s preoccupation with balance, precision and local harmony, and will be centered on Fontana’s output during the 1950s and 1960s, and Melotti’s output from the 1960s onwards. It will include works in canvas, aluminium, copper, brass, steel, iron and canvas. The friendship between Fontana and Melotti began in 1928 when they were both students of sculptor Adolfo Wildt (1868–1931) at the Accademia di Belle Arti di Brera in Milan. The pair remained friends, sharing practical and creative support throughout the four decades until Fontana’s death in 1968, and providing long-standing influence for Melotti’s later development. The exhibition examines how both artists engaged with space and navigated the relationship between a work and its environment. Fontana’s cuts pierced the surface, opening up a new space behind the canvas, which was both a real space, liberated by the cut, and a transcendent one, opened up by the imagination. Melotti’s sculptures respond to movement and vibration, creating new spaces through interactions with their given environment. Both artists were projecting meaning onto an idea of emptiness. In this way they also provided a radical response to art history: where Fontana’s cuts challenged accepted notions of materiality, Melotti strove to liberate sculpture from the centuries-old obsession with weight, through the production of light and delicate structures. Lucio Fontana was one of the most renowned artists of the post-war period in Italy. He is best known for his “cuts,” which consist of slashed, ripped or punctured canvases, and his “End of God” series of egg-shaped canvases, both of which provided vitally expressive, bombastic reinterpretations of painting that foregrounded the grand gesture and interrogated the congruence of the form. On display will be two striking examples of Fontana’s cuts (“Concetti Spaziali”) in copper and aluminium, from 1962 and 1965 respectively, highlighting Fontana’s material affinity with Melotti, in addition to their conceptual connectivity. Fausto Melotti is best known for work he created from the 1950s to the 1980s, having experienced a hiatus in artistic production during the Second World War when much of his early output was destroyed by bombing. Before turning to art, Melotti studied engineering and music and his work is acutely influenced by his musical sensibility. Tre Tempi (1971) provides an example of the musical fluency in Melotti’s work, evoking rhythm both in its title as well as structure of finely wrought geometric brass shapes on poised poles in a three-part cadency. His focus on geometric balance and lightness of form is exemplified in works such as I Maggio (1971) with its elegant simplicity of line and Tema e Variazioni IX (1980–86) which features an intricate yet refined composition of linear pattern. It is in these works that the dialogue with Fontana’s “Concetti Spaziali,” such as a three slash white work from 1967, is most evident, revealing the artists’ shared preoccupation with defining space through a simple geometric construct. The exhibition will be accompanied by a fully illustrated catalogue with essays by Daniela Ferrari, Flavia Frigeri and Sarah Whitfield.